At the upcoming 2008 CES (Consumer Electronics Show), Archos will introduce a new set-top box, imaginatively named Archos TV, that promises to give Apple TV some real competition. While it offers some killer features, especially the built-in video recorder, there’s no mention of podcast support, integration with your photo library or iTunes. So, Archos TV doesn’t look like it will be the uber-box, but we’re happy to see another interesting offering in this area. That is an absolutely terrible-looking remote. What did they do for usability testing, place a computer expert in a room with a desk, a chair and a tv? Obviously Dave has never used the remote. It’s very intuitive and fits well in your hand. Controls are easy to find. 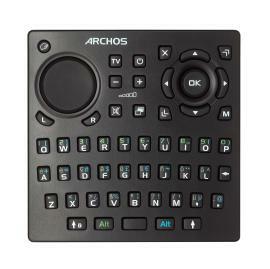 If Archos TV is anything like the Archos 605, it records anything your tv can display and, with the UPnP feature you can access all music, picture and podcast files from your PC through Wi-Fi. My iPhone friends are deeply envious of its capabilities. Plays Flash as well.